Okay, I’ll admit this doesn’t exactly have me feeling bullish. The S&P 500 is a whisker away from another all-time high. Only 27 stocks, however, are within 1% of all-time highs and 38 stocks are 30% below their 52-week high. What gives? As you probably know, the S&P 500 is a cap-weighted index, which means that Harley-Davidson, Nordstrom, Gap, Foot Locker, Goodyear, and Under Armour could all go to zero tomorrow, and it would knock 0.16% off the index. Right now, as is always the case, some stocks are going up and others are doing down, and in terms of a few stocks driving the bulk of the gains, nothing is out of the ordinary. Something that doesn’t receive enough attention is that the opposite scenario would also receive attention as a harbinger of bad things to happen. If every stock were within one or two percent of a 52-week high, we’d be experiencing stock market euphoria. The index might be making an all-time high, but I don’t see anybody, other than Ramp Capital, who is stupid bullish. The average stock is currently 12% off its 52-week high. It feels like I’ve run this number a half dozen times over the last few years when the bad breadth conversation comes up, and the numbers today are consistent with what I’ve seen in the past. Of course this is anecdotal, and the current edition could be the one that resolves itself to the downside, but every negative divergence over the last few years has proven to be a false alarm. 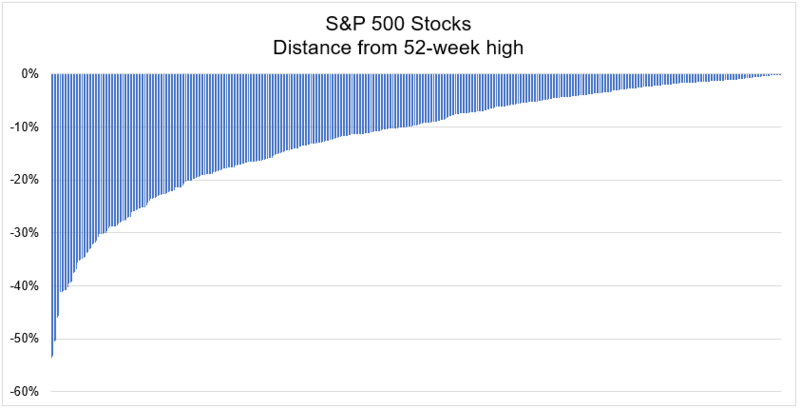 With the median S&P 500 stock just 10% off its 52-week high, we’re hardly at the stage where small stocks are crashing and the weakness is hidden by a handful of giant stocks. This could be the one that marks the top, but we won’t know until we know.